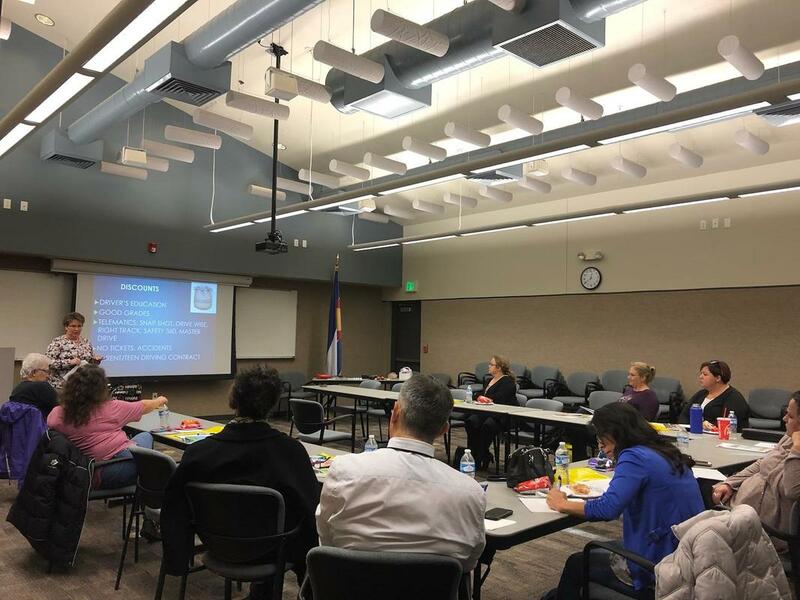 DRIVE SMART Weld County hosted a free Parent of Teen Driver's class to help parents navigate the Graduated Driver's License system. Weld County Sheriff Deputy Randy Carter and Allstate Agent Sue Helfrich taught the class which always gets a 5 star rating from participants. Our Knock Out Poor Choices event in partnership with the Milliken Police Department was a success! 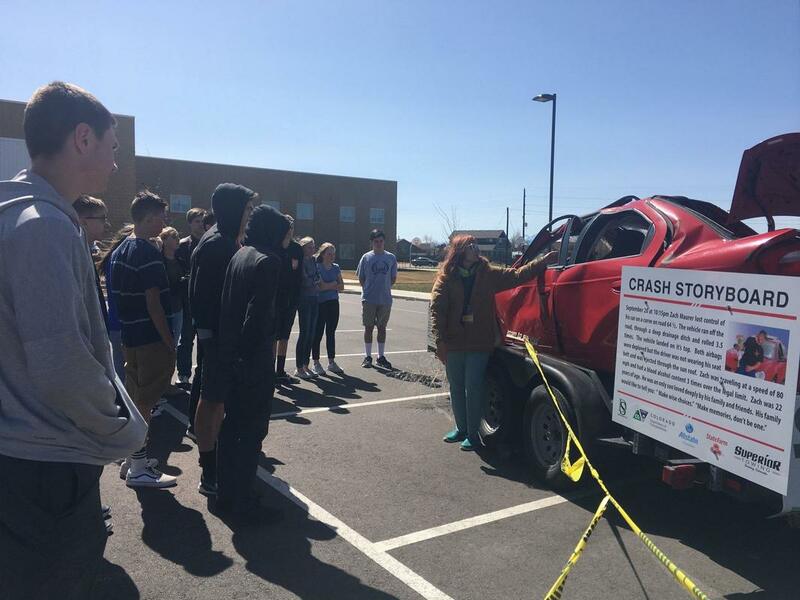 Youth and adults heard from two survivor speakers, received education about seat belts, Graduated Driver's License, and driving under the influence, and visited a crash car that was involved in a fatal crash. Participants went away knowing the importance of making wise choices. The five schools are busy completing their first school seat belt checks. Checks will be made three times during the school year. Students at Windsor Charter Academy complete and early morning seat belt check. DRIVE SMART Weld County representatives Marjorie Hanson/DSWC, Stacey Chase/Banner Paramedics and DSWC Chairperson, Sara Kos/Colorado Motor Carriers, and Erin Olsen/WCDPHE present Fort Lupton High school assistant principal Jeff Hoff with a check for $950 for the work he and his Kazin did over the school year as participants in the BUCKLE UP DRIVE SMART program. Congratualtions! 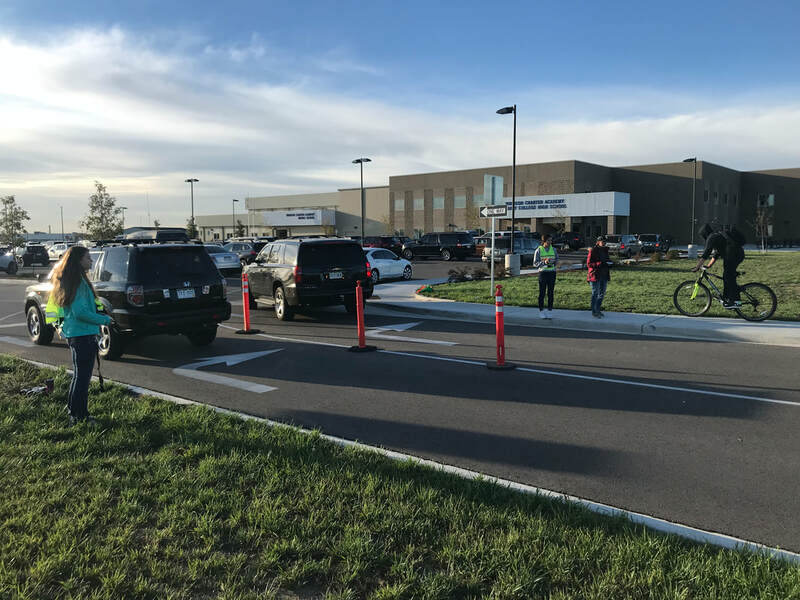 Fort Lupton High did many activities prior and during prom t remind students to drive safely on this night and every other time they get behind the wheel. Students arrive for an all school assembly where teacher Joey Taylor talked to them about making wise choices behind the wheel. Two of the DSWC crash cars are part of a pre-prom safety awareness campaign at University High School. 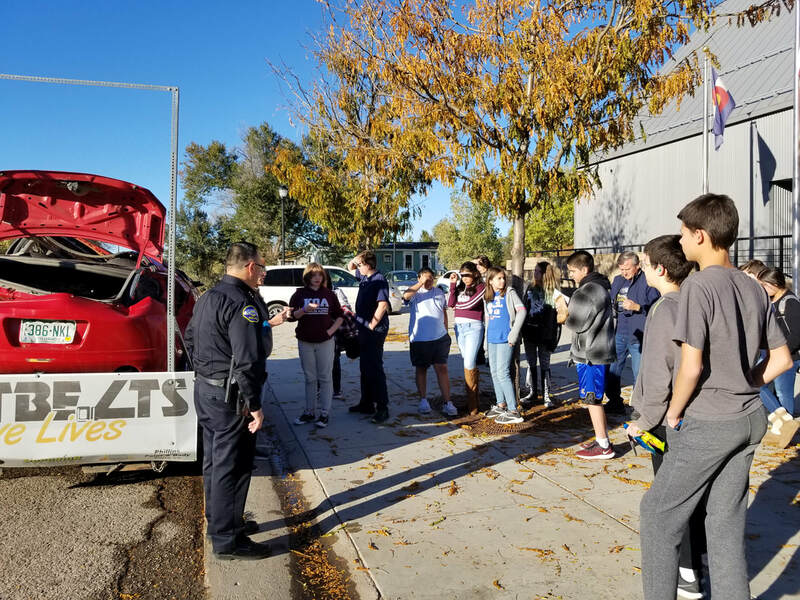 DRIVE SMART Weld County coalition members helped Windsor Charter Academy host a safe driving event for it's sophomore class. The event included a visit from the crash cars to help students see the importance of seat belts and making wise choices behind the wheel. 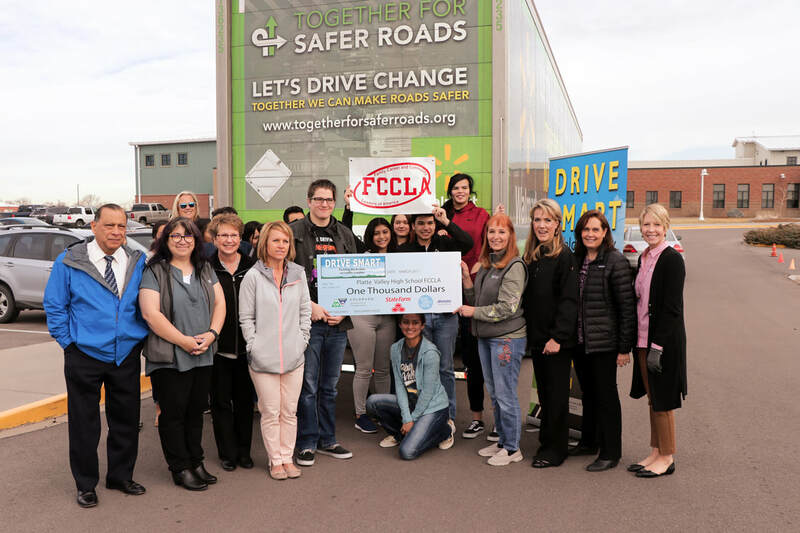 Congratulations to the Platte Valley High School FCCLA for earning $1,000 for their efforts to educate peers about safe driving habits. They were part of this years Buckle Up Drive Smart teams and were the first to reach their goal. 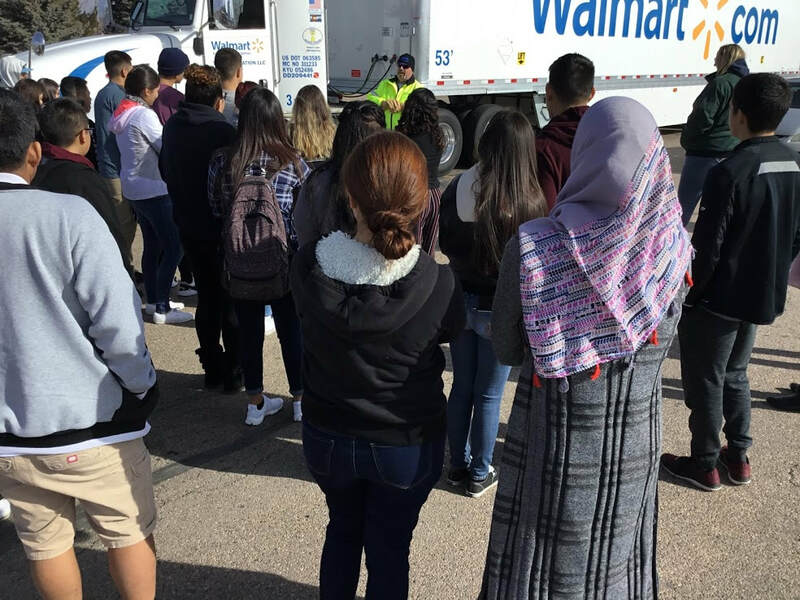 As part of their event they sponsored the Truck Smart event which gives drivers a chance to experience a big rig and it's blind spots up close thanks to Walmart and the Colorado Motor Carriers Association. Marjorie/DSWC presents Platte Valley sophomore Memphis with the check the FCCLA earned. Driver Mark Oliva has over 4 million miles under his belt and shares his experiences and safety message with students. 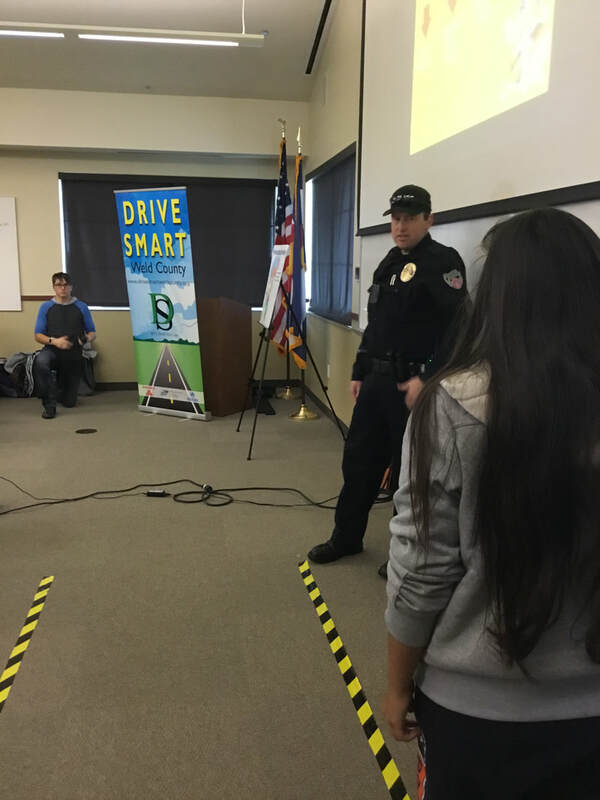 Weld County-Drive Smart Weld County announced today it has received a $15,000 grant to help teach teens about safe driving. 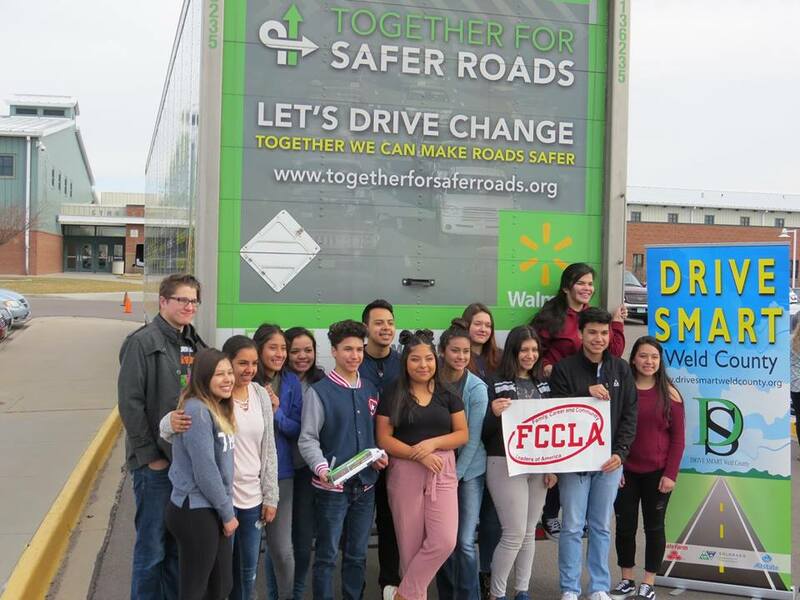 DRIVE SMART Weld County, a program created to reduce vehicle injuries and deaths among teens, won State Farm’s 2018 Good Neighbor Citizenship Award. Weld County has some of the highest motor injuries and deaths in Colorado. The DRIVE SMART program is trying to reduce those numbers. 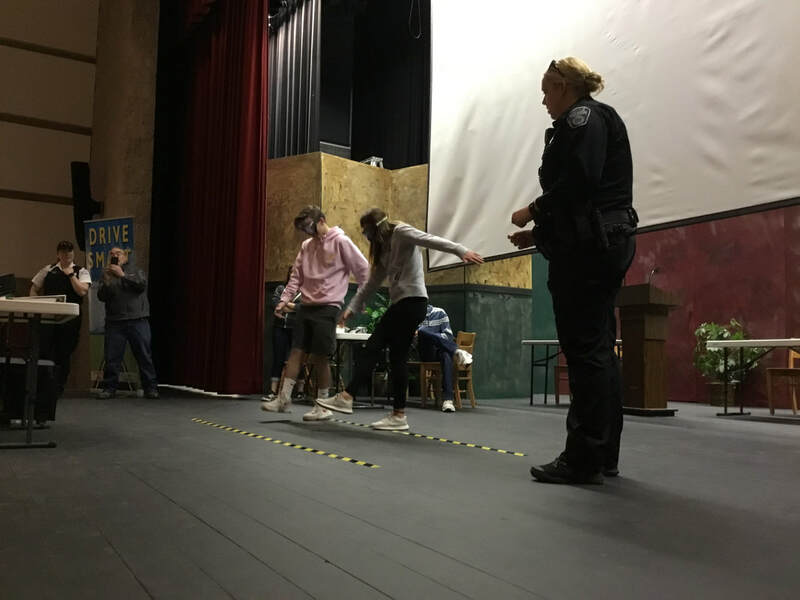 Program officials visit high schools in Weld County and teach teens about the dangers of unsafe driving. 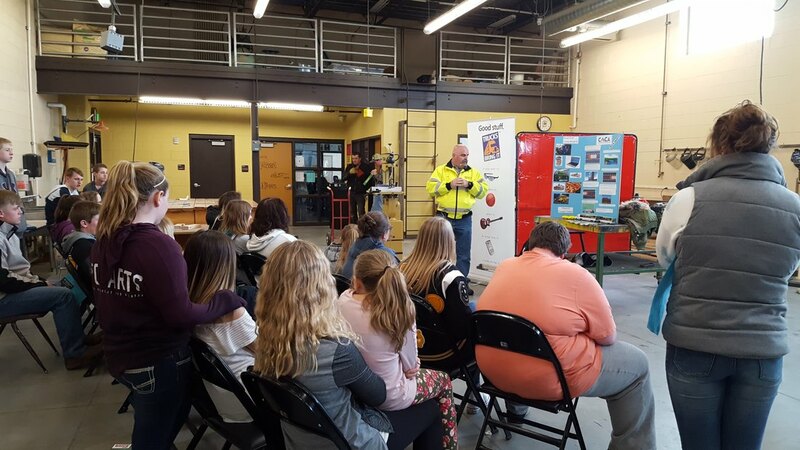 First responders, law enforcement officers, semitrailer truck drivers and others present graphic traffic crash information to the high school students. 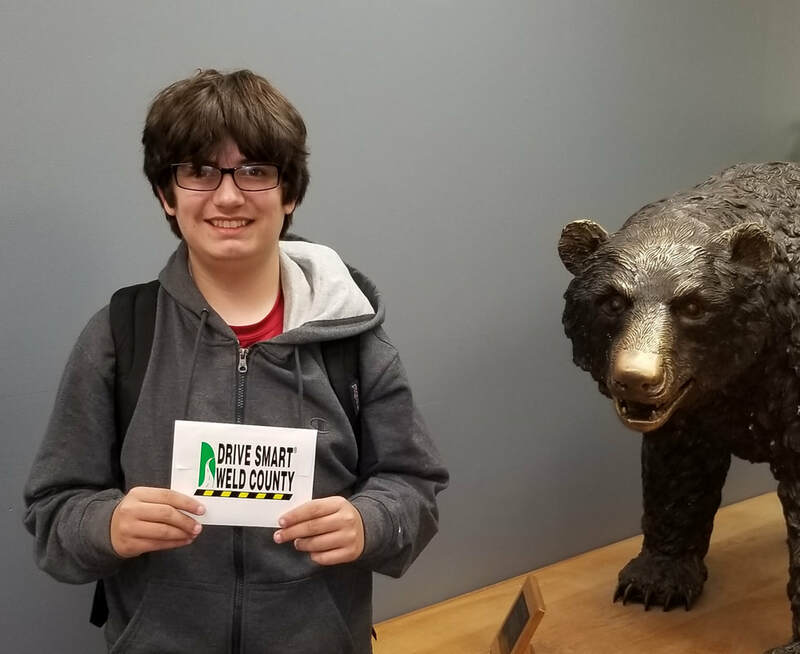 DRIVE SMART Weld County will spend the money on student-led safety programs where the students create safe driving activities and programs throughout the school year. The award also will fund Parent of Teen Drivers classes which teach parents and teens about driver’s license laws, insurance requirements and discounts. 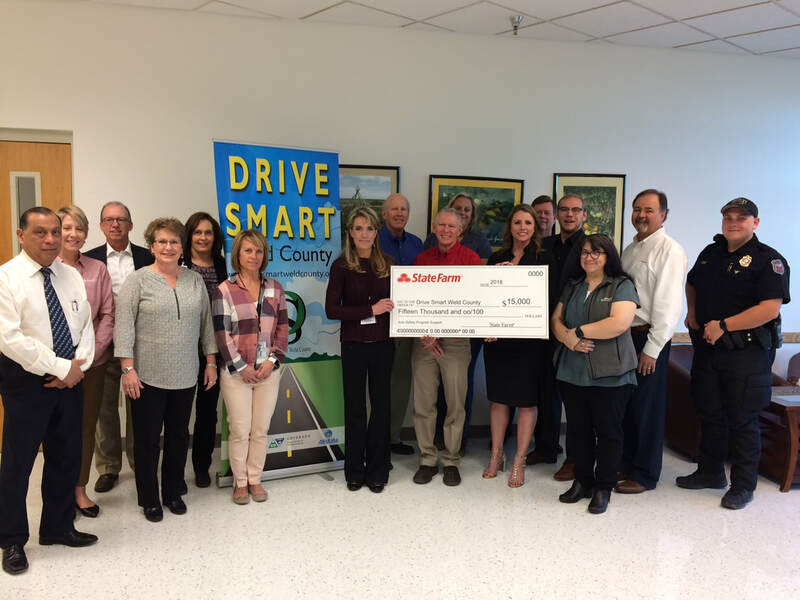 For the past 20 years, Drive Smart Weld County has received grants from State Farm totaling over $150,000 for safe driving programs. DRIVE SMART Weld County was a part of the launch of Greeley Police' Drive Nice, Think Twice campaign. Marjorie Hanson DSWC Public Relations and Outreach coordinator spoke and the coalition provided a crash car. Residents are encouraged to be mindful drivers. Marjorie/DSWC and John/Superior Towing pose in front of the crash car. Sergeant Lobato gets a poll from the crowd about driving habits. 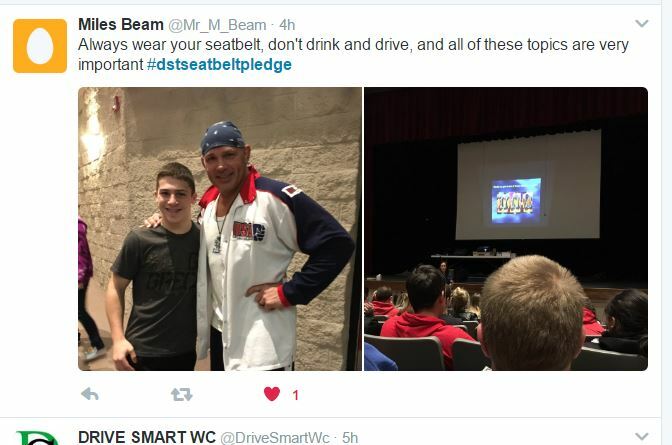 DRIVE SMART Teen made a stop at Eaton High School. Thanks to the Eaton PD for participating, Kelsey Hemenover for sponsoring and a great bunch of students! 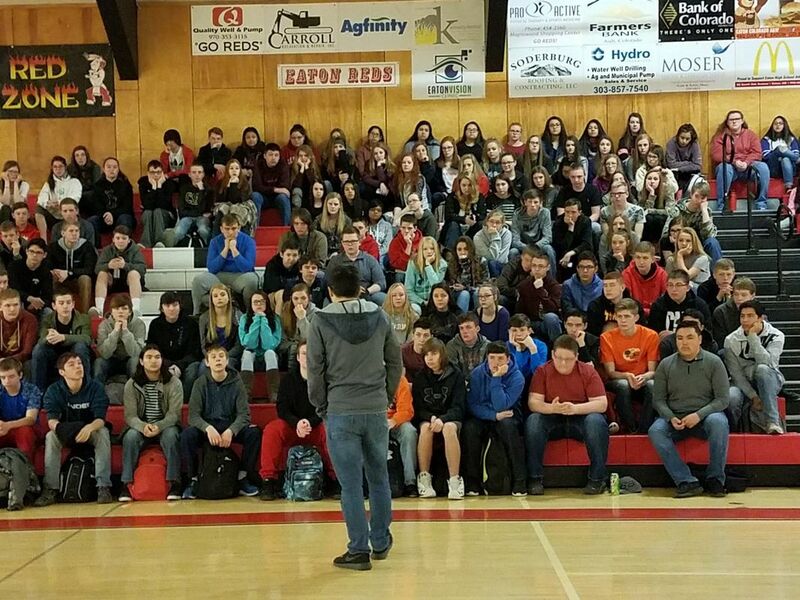 DRIVE SMART Teen was at Valley High speaking to Scott Leffler's classes. Platteville officers did an awesome job talking to students about GDL, distracted driving, seat belt safety and driving impaired. 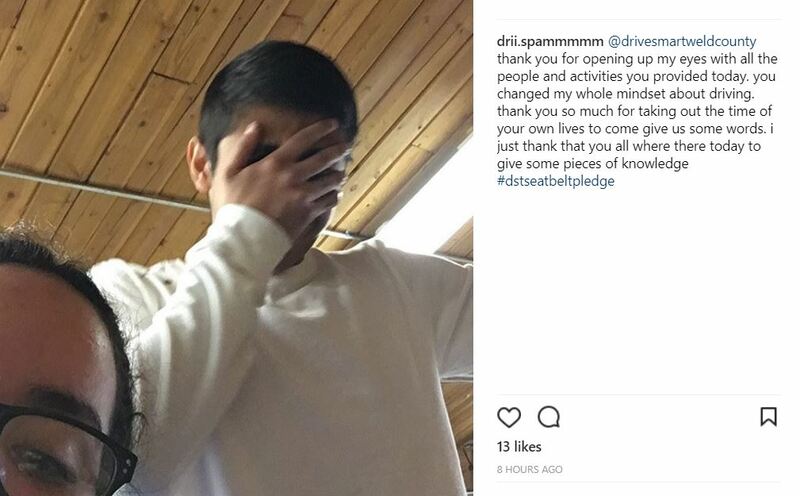 Owen Myer's winning safety pledge. It was a chilly, blustery morning but that didn't stop our team and the students from Prairie High school (They grow them tough out there!) from learning about how to be safe while driving around big rigs. Walmart brought their safety trailer which is an educational tool all by itself! We talked about No Zones, braking and turning distances, seat belts and answered student questions. Thanks for having us Prairie! 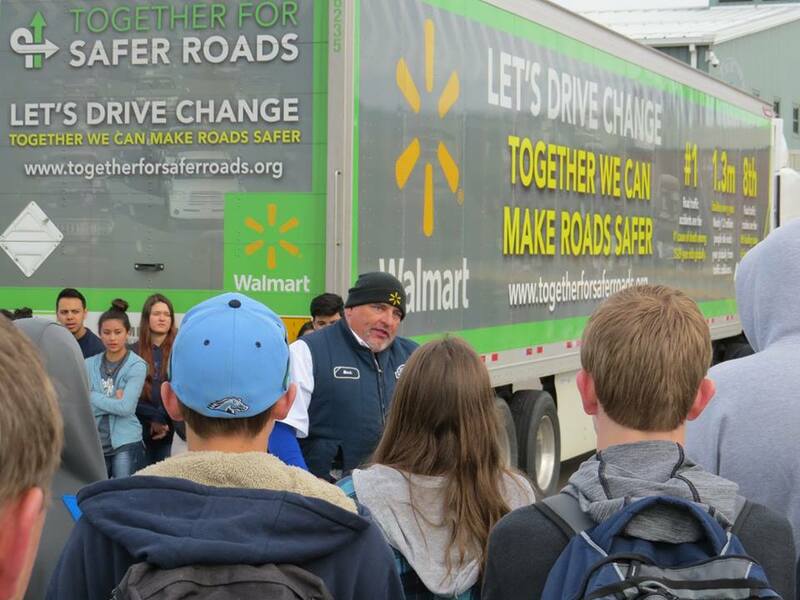 Walmart Safety Manager Curtis Lewis talks to students about the blind spots on a big rig. When in the cab, students couldn't see the dual cab GMC parked behind it at all. Truck Smart was at Greeley West HIgh School sponsored by the AVID program. Many students stopped by to learn about driving wisely around a big rig. ​We had a great first outing of the Truck Smart program at Highland High school! 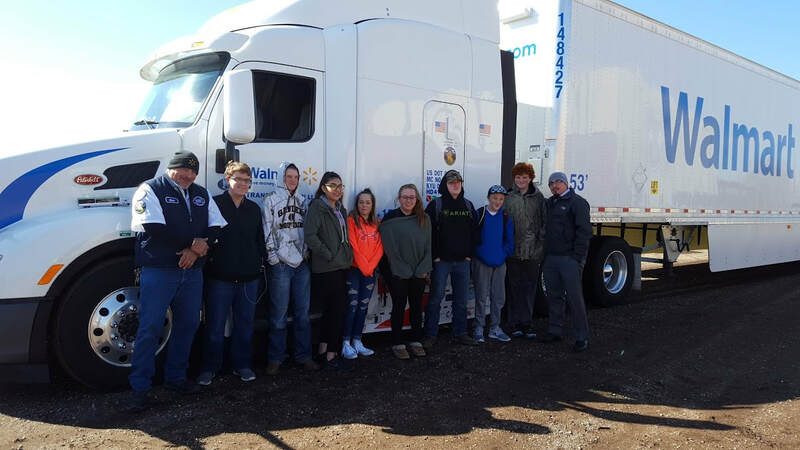 Students were able to climb in and experience a big rig and see the No Zone blind spots for themselves along with the opportunity to talk to a professional driver with over 4 MILLION miles under his belt! One of the many groups that braved the chilly temps to climb in and learn Truck Smarts. Roosevelt High hosted the DRIVE SMART Teen program for over 100 freshman. 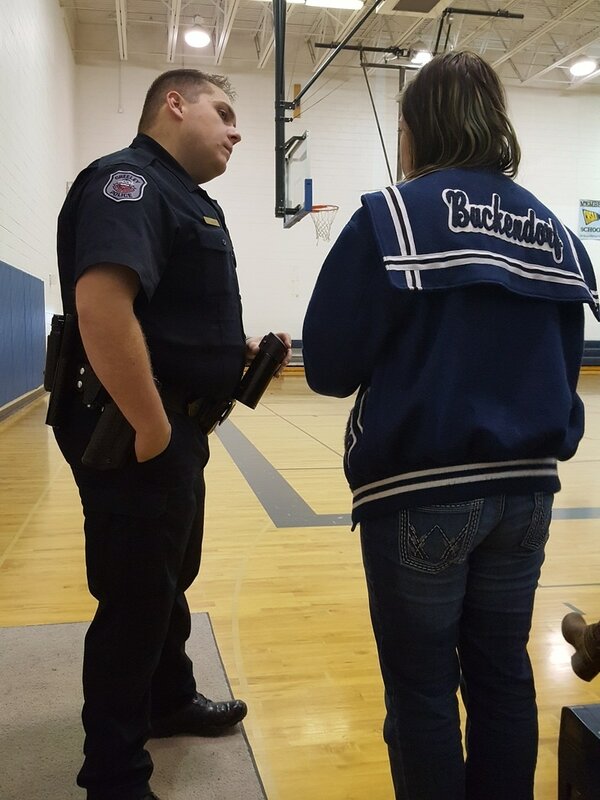 Local police officer Bailey Kehr did a great job interacting with students! Officer Kehr deploys the Fatal Vision goggles for roadside sobriety tests. Students were eager to answer questions! 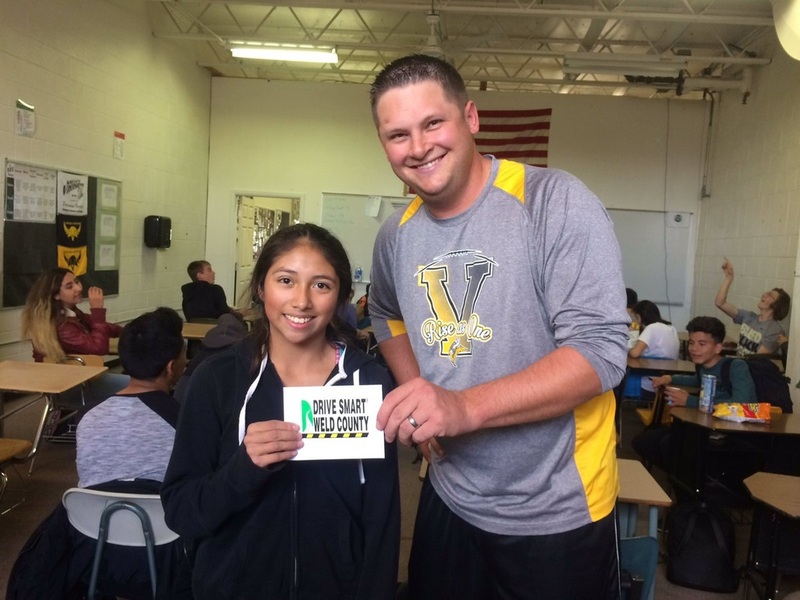 Coach Wasinger did the honors and presented Adriana Trujillo a $25 gift card from DSWC for her winning instagram post. 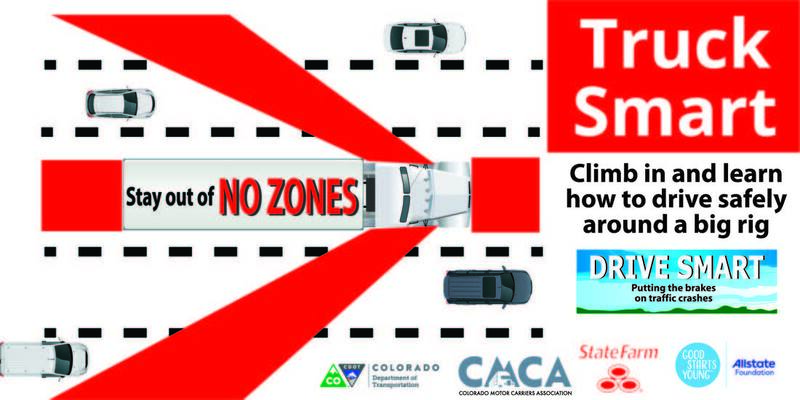 DRIVE SMART Weld county has partnered with Walmart and Colorado Motor Carriers Assoc. 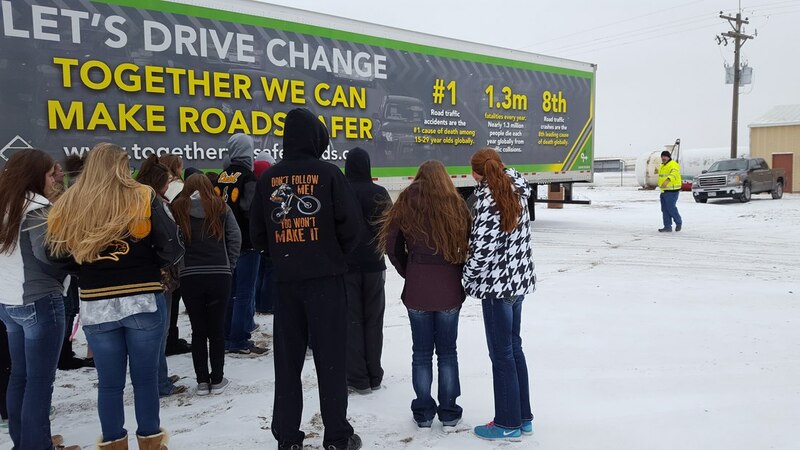 to teach teens and the community about driving safely around big rigs. We will be at Highland High school Tuesday, February 6, 11:30am - 1:30pm and Greeley West south parking lot on February 7, 10:30am - 12:30pm. 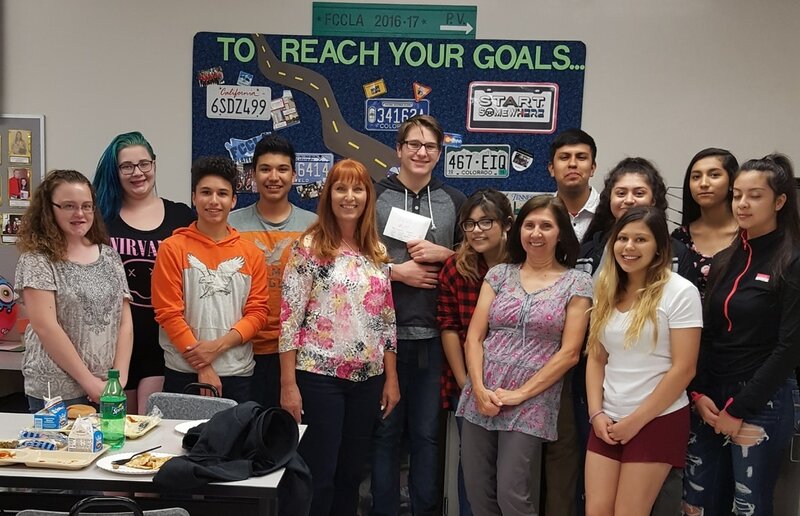 Congratulations to Victoria Neuschwanger, Early College Academy and Veronica Hernandez Jackson, Early College Academy who have been awarded the Fourth quarter Driver's Education Scholarships! DRIVE SMART awards 8 scholarships a year. It's never too early to get your applications in for the next quarter which will be in January 2018. If you have a teen getting ready to drive next year plan ahead and apply! See the Scholarship page for more information. 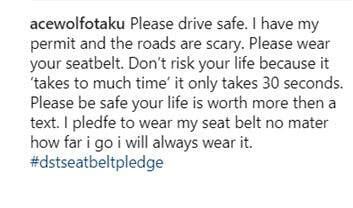 Faith Stephens was the winner of the #dstseatbeltpledge! Thanks to Kersey Fire Department for letting us use their facilities to host the Platte Valley DRIVE SMART Teen program to the freshman. Officer Thienes of Kersey PD did an awesome job presenting the Law Enforcement piece! ​Cassidy Reed won a $25 gift card for her winning safety message! 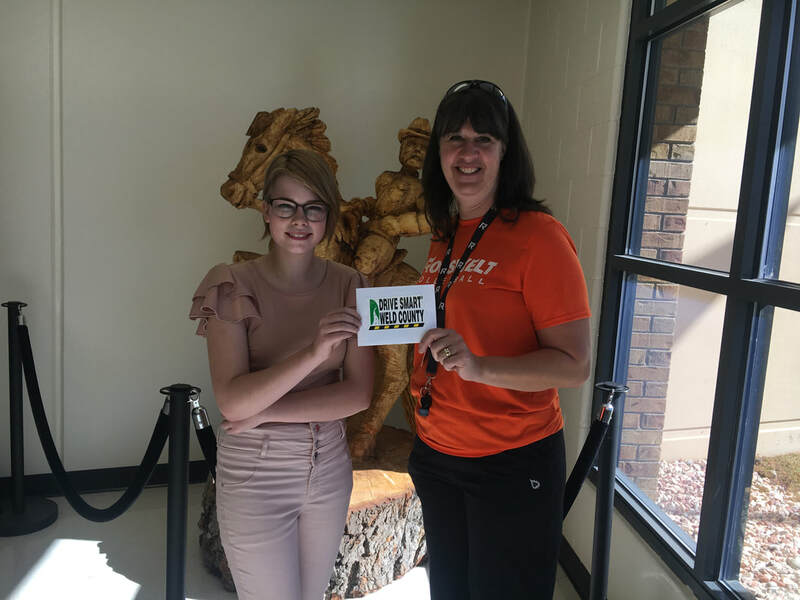 Roosevelt teacher Robin Wells presents student Macey Parrott with a $25 gift card from DRIVE SMART for her winning social media pledge. 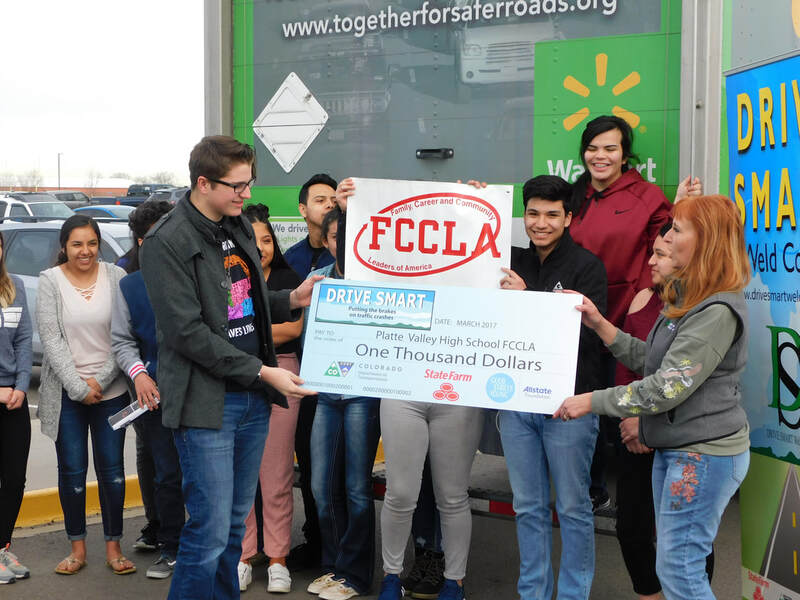 Drive Smart Weld County announced today it has been awarded a grant from the Allstate Foundation supporting their Teen Driving Program for Weld County high schools. The Allstate Foundation award will also provide funding for the Parent of Teen Driver Classes (PTD) which teaches parents and teens about Colorado’s Graduated Driver’s License laws. PTD encourages parents to design contracts with their teens to establish acceptable boundaries and consequences for young drivers. 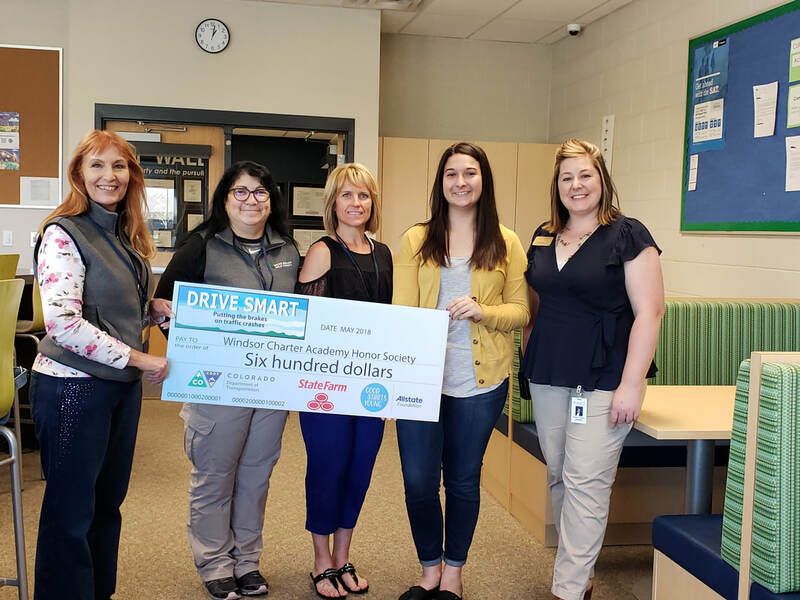 ​Drive Smart Weld County (DSWC) announced today it has been awarded a grant from State Farm supporting their Teen Driving Program for Weld County high schools. The overarching goal of DSWC is to reduce motor vehicle related injuries and deaths among teens aged 14-19 years old. 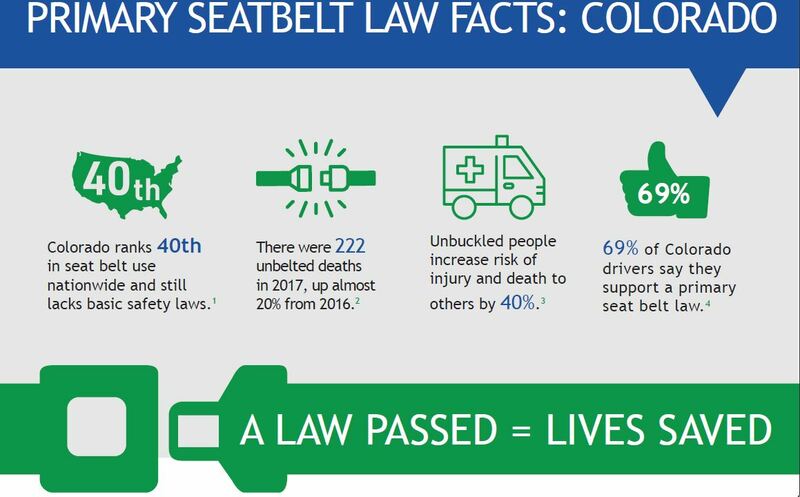 Weld County continues to rank as one of the highest of all counties in the state for motor vehicle related injury and death. DSWC strives to decrease teen motor vehicle crashes, decrease teen motor vehicle-related hospitalizations and decrease teen motor vehicle death rates. This award will allow DSWC to increase levels of coordination among community partners and educate the community on the risks and protective factors associated with teen motor vehicle injuries and deaths. As part of the DSWC Teen Driving Program, volunteers travel to high schools throughout the county engaging young drivers with strong visual presentations about car crashes from law enforcement, first responders, hospital trauma, insurance, semi-drivers, and survivors of local crashes with hopes of impacting the teens and allowing them to realize they are not invincible. The aim is to empower students to make responsible choices, keeping them, their friends, and family members safe when driving. The award will also provide funding for high schools to implement a yearlong student led safety challenge. This challenge encourages students to take ownership of a safety program and engage their student body in safe driving activities and programs throughout the entire school year. The State Farm award will also provide funding for the Parent of Teen Driver Classes (PTD) which teaches parents and teens about Colorado’s Graduated Driver’s License laws. PTD encourages parents to design contracts with their teens to establish acceptable boundaries and consequences for their young drivers. Drive Smart WC partnered with Evan's Police to bring seat belt awareness to residents during the Evan's Heritage Fair. DRIVE SMART WC participated in the University of Northern Colorado Safety Fair. DRIVE SMART WC was a sponsor and had a team in the second annual Walk Like MADD fund raiser at Promontory Park. Over $16,000 was raised to help victims and their families. A photo from the Click It or Ticket campaign launch this morning at NCMC. DSWC provided two crash cars with the help of Superior Towing. There were representatives from CDOT, Greeley Police Department, Evans Police Department, Fort Lupton Police Department, survivors and NCMC trauma staff. Members of DRIVE SMART Weld County coalition pose with members of Evans PD, Fort Lupton PD and Greeley PD in front of one of the crash cars whose owner survived the crash because of his seat belt. 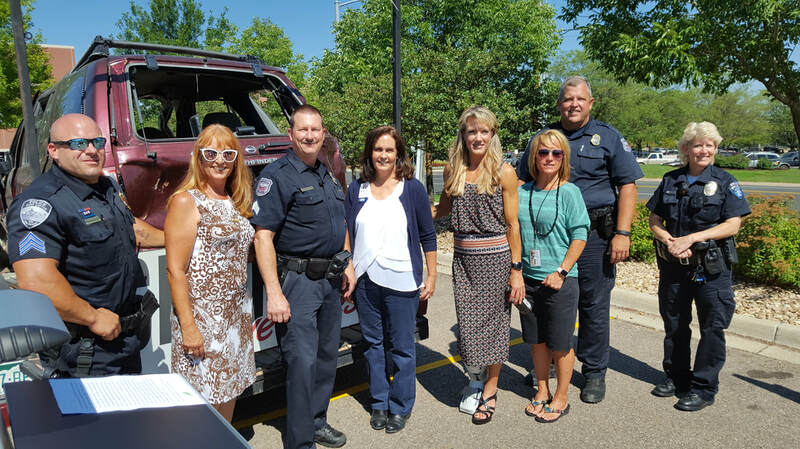 DRIVE SMART Weld County partnered with the Evans Police Department to bring a crash car to Burger King's grand re-opening safety fair. Officers from Evans and Greeley talked to residents about making wise choices behind the wheel. 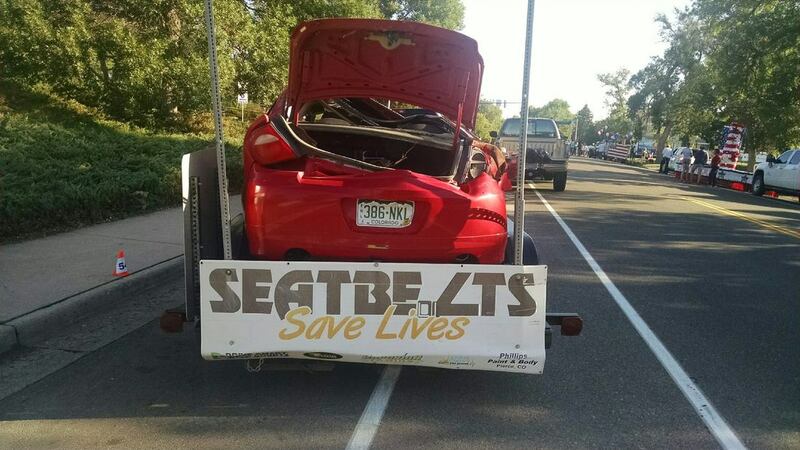 DRIVE SMART Weld County had one of the coalition's crash cars in the Greeley Stampede 4th of July parade. Sarah Kos from Colorado Motor Carriers towed the car along the parade route helping to share the message that seat belts save lives. 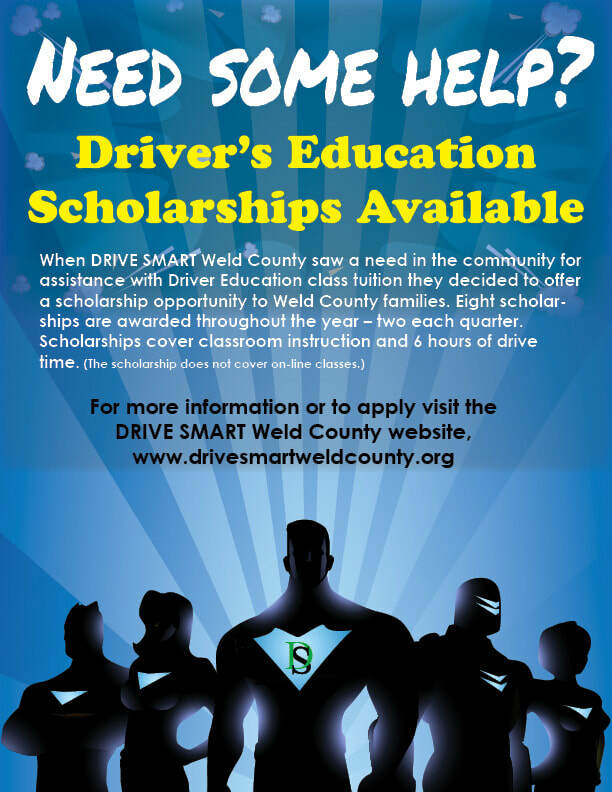 When DRIVE SMART Weld County saw a need in the community for assistance with Driver Education class tuition they decided to offer a scholarship opportunity to Weld County families. Eight scholarships are awarded throughout the year – two each quarter. Second quarter recipients are: Alexandar Sasse / WInograd and Rhys Maxey / Platte Valley High School. 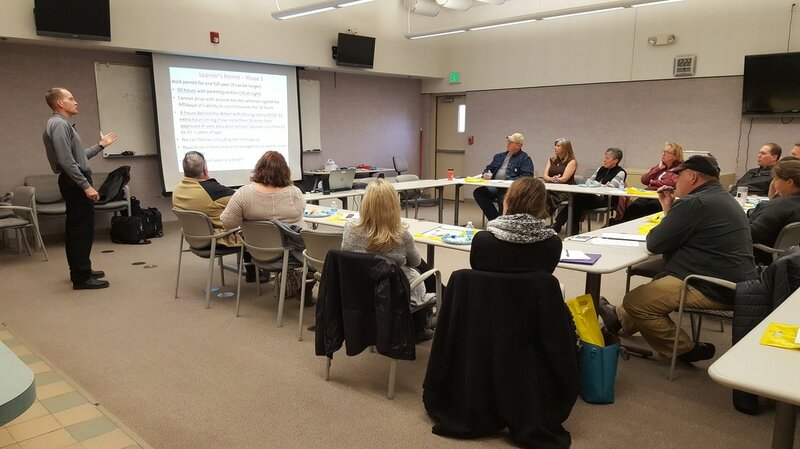 DRIVE SMART Weld County coalition member and speaker Scott Murray was featured in the Greeley Tribune for his work as a CDL instructor for Aims Community College. We are proud of you Scott and appreciate the work you do for DRIVE SMART! Platte Valley FCCLA was awarded $550 for their Buckle Up Drive Smart activities over the year. They submitted a winning video and had a very creative pre-prom safety campaign along with several other activities over the school year. Sponsoring teacher Janet Niederkorn posed with students and DRIVE SMART Weld County representative Marjorie Hanson at the celebration party. 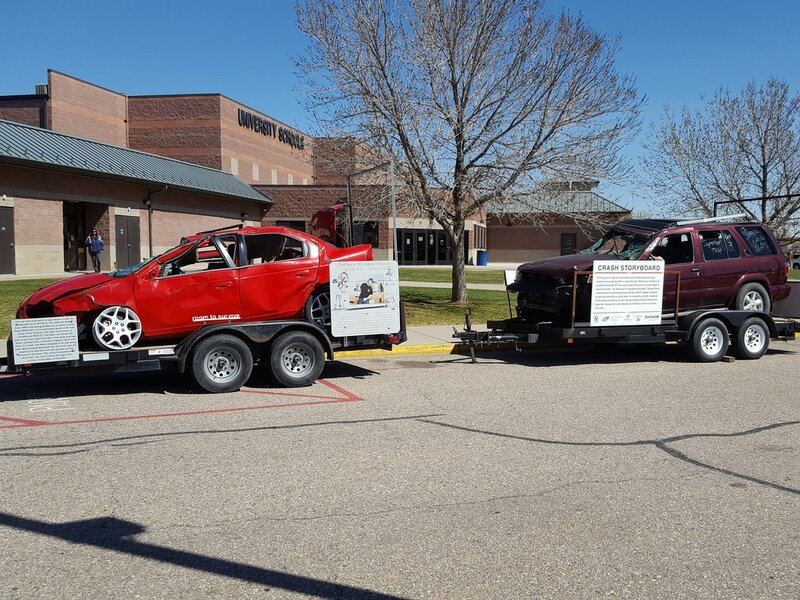 Superior Towing's dynamic duo Gary and JJ delivered the DRIVE SMART WC crash cars to Windsor High School this morning to be part of the school's Distracted Driving event. 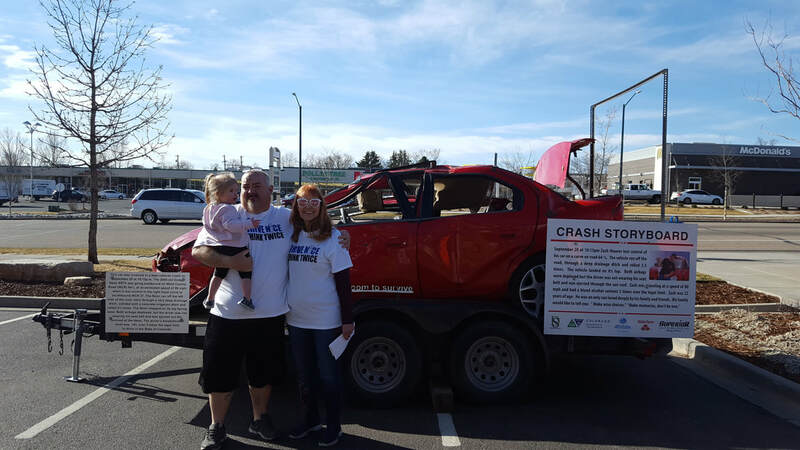 Teacher Kevin Johnson had planned a day of activities and speakers to raise awareness about the dangers of distracted driving. A WCA student takes a seat in a wheelchair while students listen to survivor Luis Cerenil tell the story of his distracted driving crash. 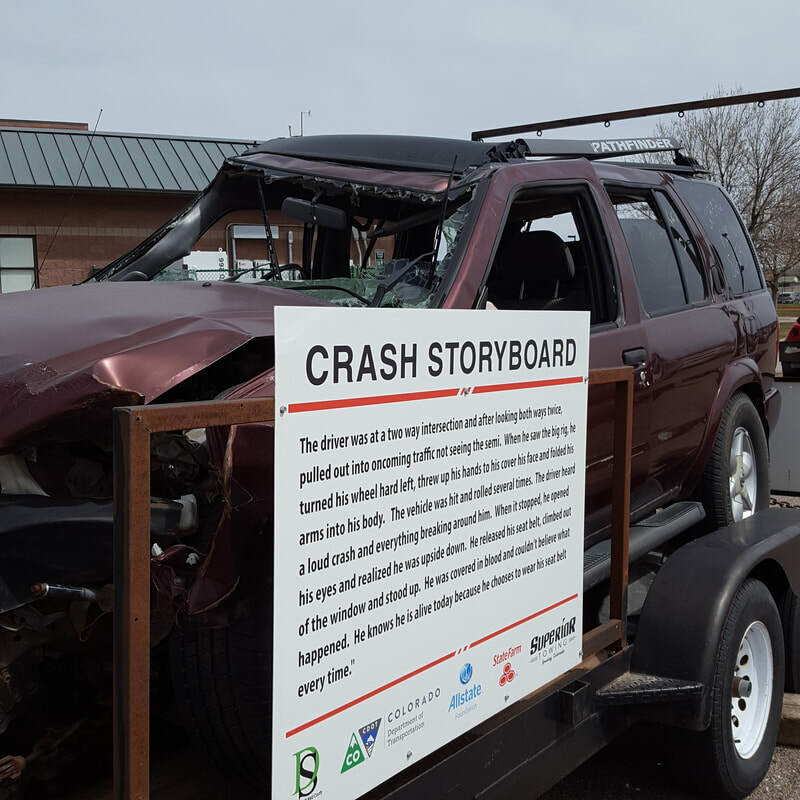 DRIVE SMART Weld County crash cars are at University High School in Greeley to help with pre-prom safety awareness. Buckle Up Drive Smart participant Madisyn will be having the driver of one of these cars speak. Two students, Garrett and Mathew, who are working on their senior safe driving project brought the DRIVE SMART Teen program to Union Colony. It was a good morning interacting with students. DRIVE SMART Weld County team members listen to survivor Luis Cerenil tell his story. What a great morning with the Platte Valley Broncos! Ninety one fantastic students learning to make wise choices. 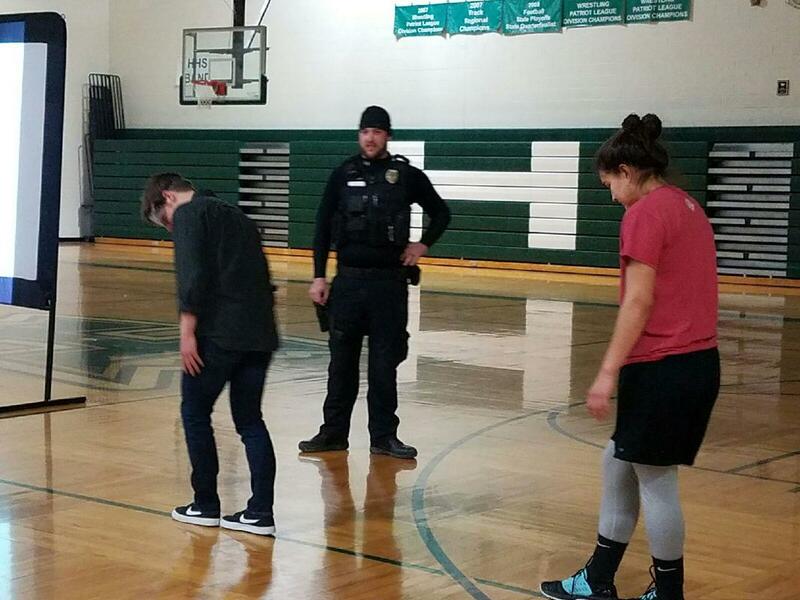 Colorado State Patrol trooper Fetzer talks a student through what a roadside sobriety test looks like. Banner paramedic Chase engages students in a distracted driving discussion. 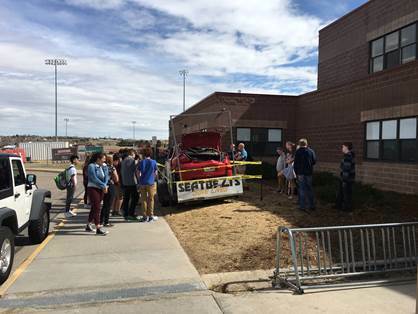 DRIVE SMART Weld County brought two of their crash cars to assist Frontier High School with their safe driving event. Greeley Police Officer Colby Zander spoke along with several other speakers. 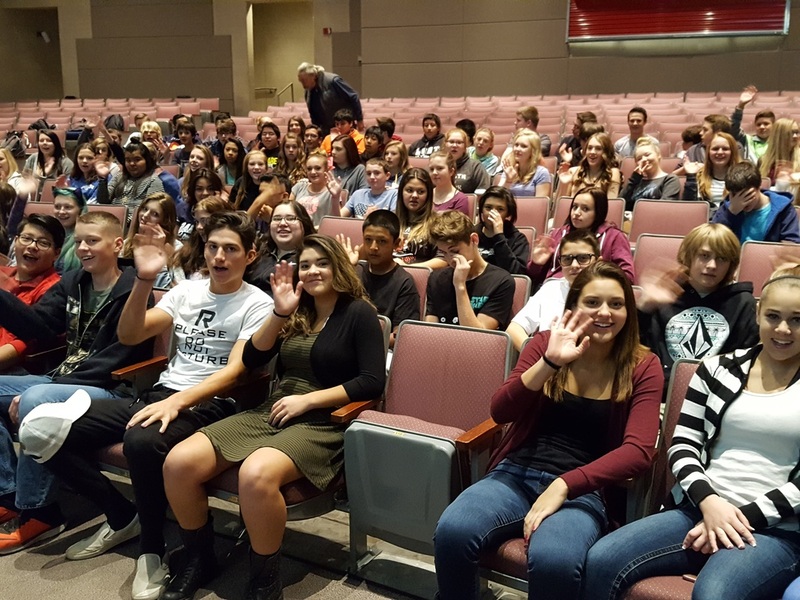 Eaton High school hosted the DRIVE SMART Teen program to a group of 148 enthusiastic students. Many thanks to all the students that tweeted positive feedback for the program! Banner paramedics and Eaton Fire Dept. demonstrate triage and the use of a back board. The DRIVE SMART Teen program was at Valley High school yesterday with another group of great students. Thanks to Valley High and teacher Scott Leffler for hosting! 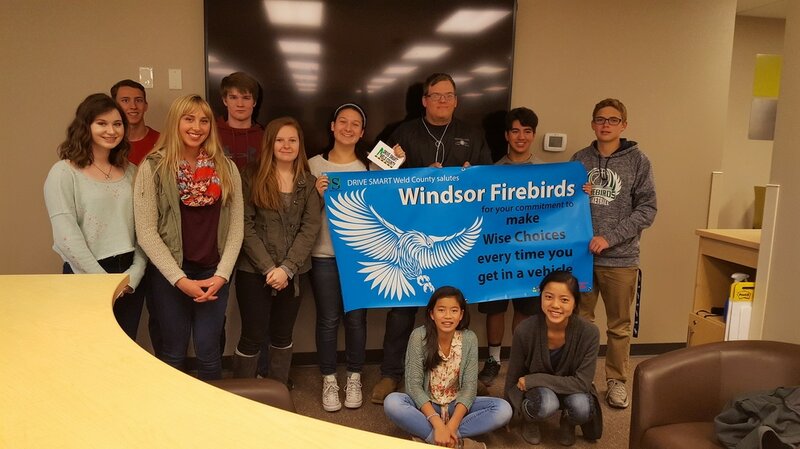 Ron Waterman, Banner Paramedics does feats of strength and then talks to students about making wise choices and wearing their seat belts. DRIVE SMART WC participated in Banner Health's Day of Dance. Every booth had a game theme. DRIVE SMART WC played the Distract A Match game to teach drivers the dangers of distracted driving and make them aware of the Greeley distracted driving law. Graduated Driver's License laws were also discussed. DRIVE SMART WC partner Marilyn Sykes/Banner Health and DRIVE SMART WC Outreach Coordinator Marjorie Hanson take a selfie before the crowds arrived. DRIVE SMART WC partner Erin Olson/WCDPHE facilitating the Distract A Match game. Congratulations to Gabriel Royal winner of the first quarter Driver's Education Scholarship! Thanks to Zack Sandstrom for hosting the DRIVE SMART Teen program at Highland High! It was a fun, interactive day with speakers and students. 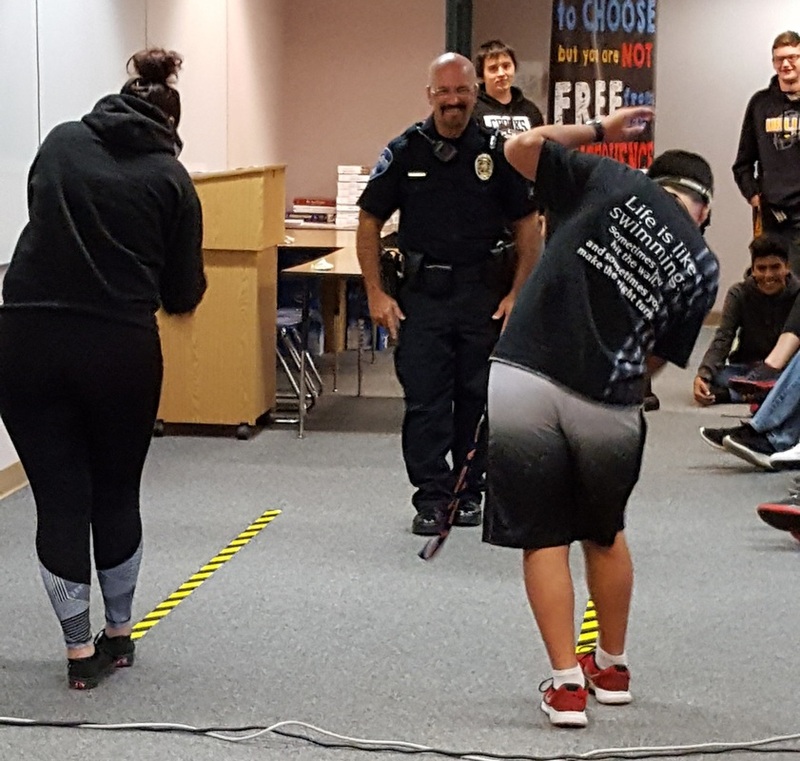 Ault PD making students walk the line with Fatal Vision goggles. Worked with a wonderful bunch of students at Roosevelt High School. 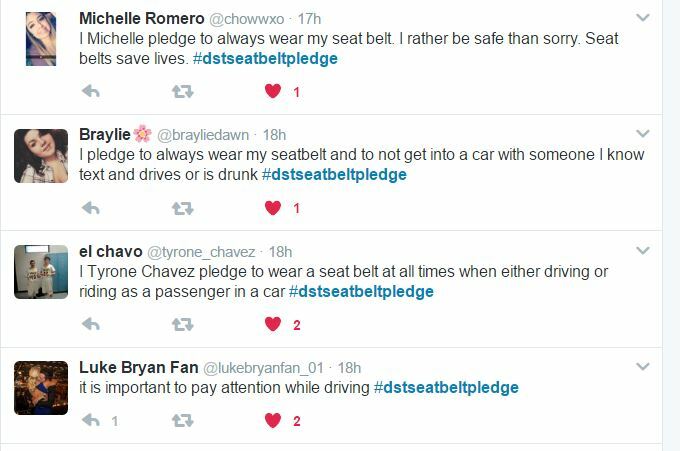 There were so many good tweets to #dstseatbeltpledge that we had to draw names for a winner. Kole West received a $25 gift card for his tweets. Many thanks to Ron Waterman, Marva Wilcox, Officer Brown, and Veronica Schlagel for their presentations! DRIVE SMART Teen program at University High School. 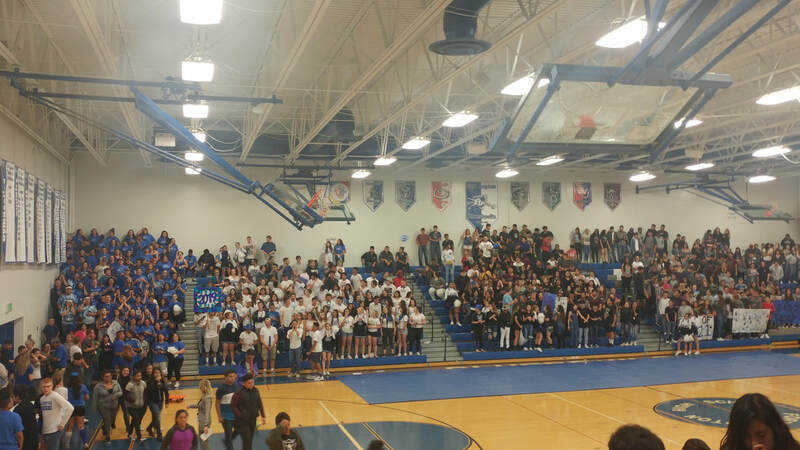 There were 142 great students! 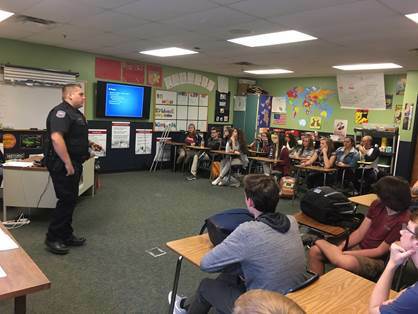 Officer Zander from Greeley PD presented and then talked to students one-on-one during the break. Deputy Randy Carter speaks to participants at yesterday's free Parent of Teen Driver class. Our next class will be January 25th at Anshor Driving School. Greeley PD Officer Colby Zander, a part of DRIVE SMART Weld County coalition, was interviewed in this article addressing drunk driving by the Greeley Tribine. November 3. 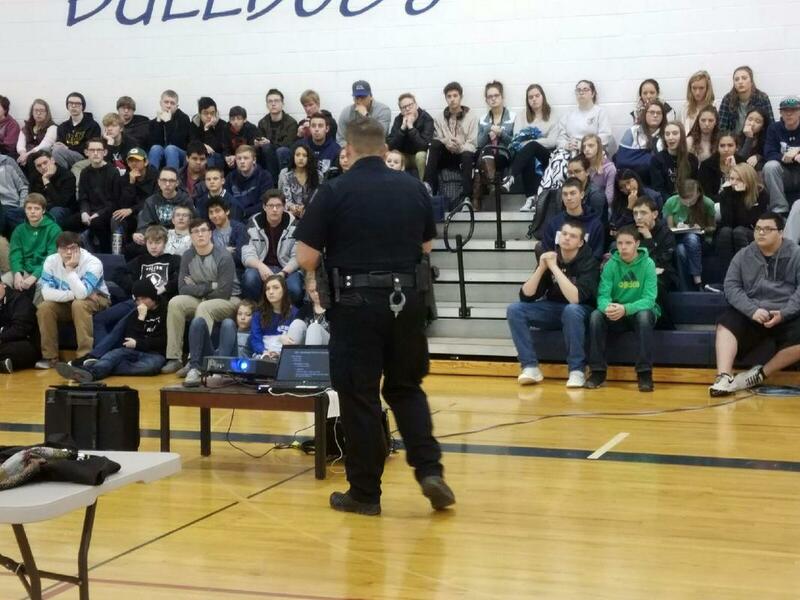 2016 Supported Greeley Officer Zander as he presented to the Greeley West juniors. Lots of good tweets! We had to draw a name from several of the best! Makaya was the winner! October 25. 2016 We were treated to this happy greeting at Roosevelt! As always, this student body and teacher Robin Wells were wonderful to work with. Kersten was the seat belt pledge twitter winner! October 18. 2016 Always good to work with Scott Leffler and Valley High! SRO Lago did an awesome job engaging students! April was the winner of the twitter contest! October 11. 2016 A large group of students at Northridge today! The winning tweet was actually a great little video about driving distracted! Good job Amy Haining! 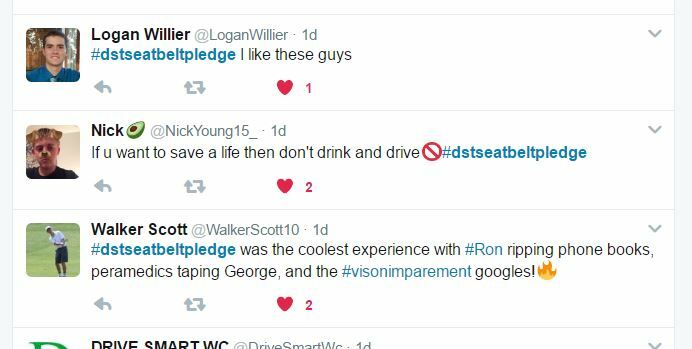 Here are a few of the tweets from the DRIVE SMART Teen program at Weld Central yesterday. Thanks to students and staff (Melissa Jones) for a great morning! 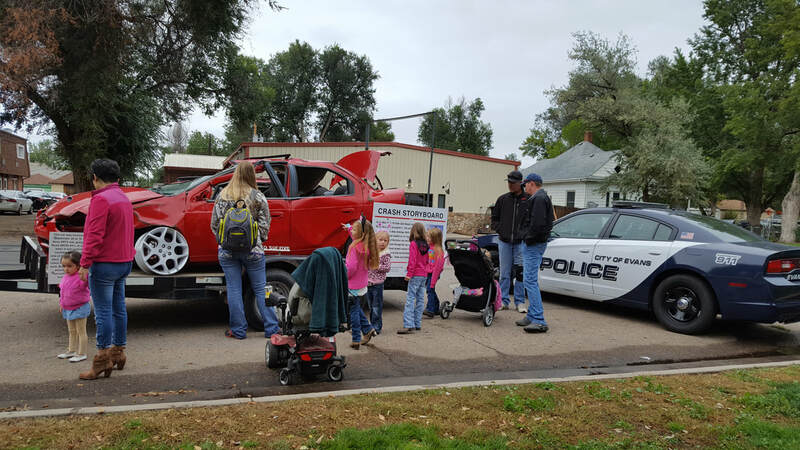 DRIVE SMART Weld County partnered with Greeley PD at the Greeley Octobrewfest to raise awareness for distracted driving. DRIVE SMART Weld County participated in Walk Like MADD as a sponsor and a team at Promontory Park. Over $15,000 was raised to help MADD programs in Northern Colorado. Here a walker attempts the Distract-A-Match game which helps to understand the complication of doing more than one thing at a time when behind the wheel. 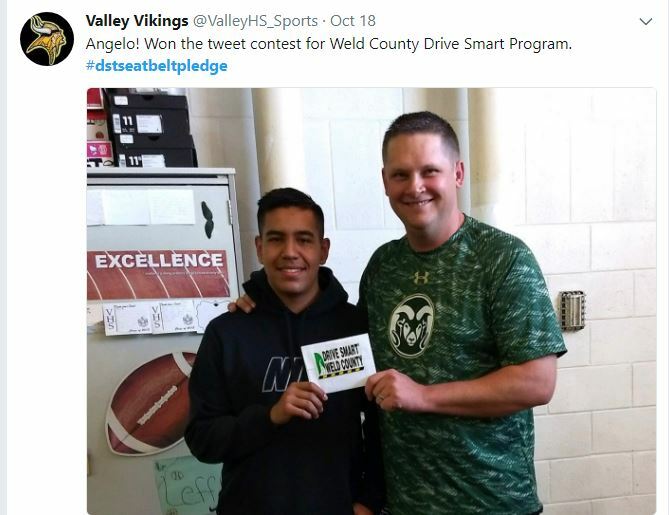 The Allstate Foundation is delighted to announce that it has processed the grant to Drive Smart Weld County to support the DRIVE SMART Teen Program in the amount of $18,000. For 60 years, The Allstate Foundation has proudly supported a wide range of projects and organizations that have made a genuine difference in communities across the country. We are pleased to build on that legacy now by supporting your valuable work. DRIVE SMART Weld County loaned Johnstown PD the Fatal Vision Goggles and State Farm Driving Simulator to help make their National Night Out a success. We appreciate all they do to keep us safe! 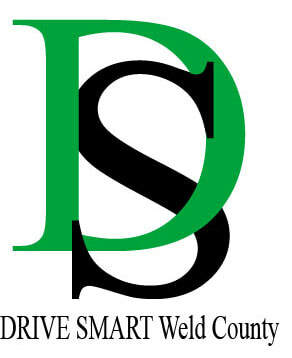 DRIVE SMART Weld County is a proud sponsor of the Weld County Fair! Be sure to attend and support Weld County youth. DRIVE SMART Weld County awarded $15,000 State Farm "Good Neighbor Citizenship Award"! 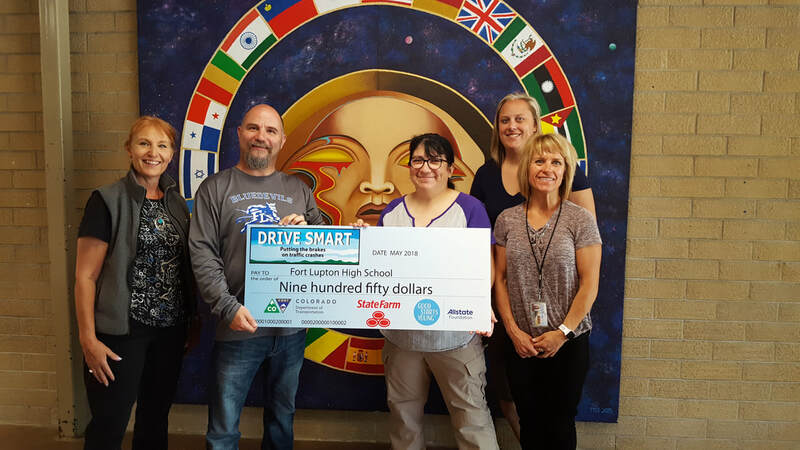 Drive Smart Weld County announced today it has been awarded a grant from State Farm supporting their DRIVE SMART Teen Driving Program for Weld County high schools. 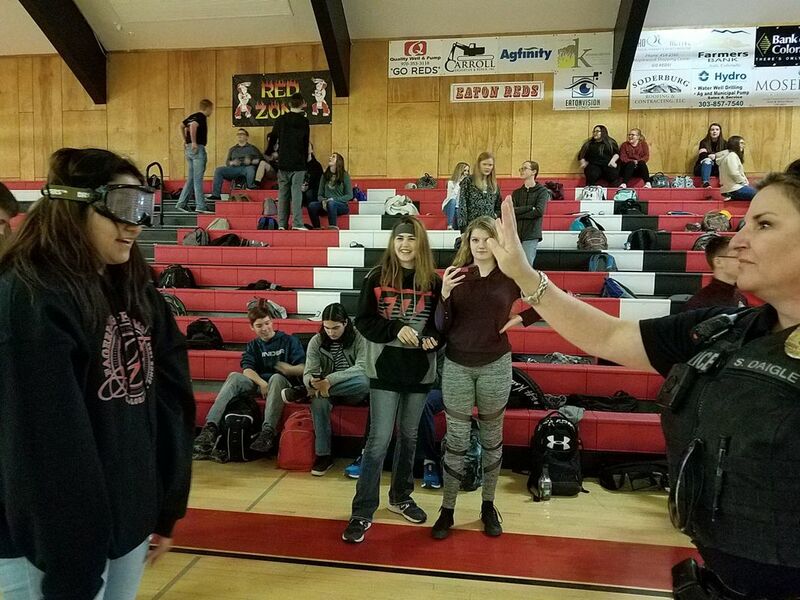 As part of the DRIVE SMART Teen Driving Program, volunteers travel to the high schools, at no cost to the schools, to engage every teen with law enforcement, first responders, hospital trauma, insurance, and survivors with hopes of impacting the teens to realize they are not invincible. 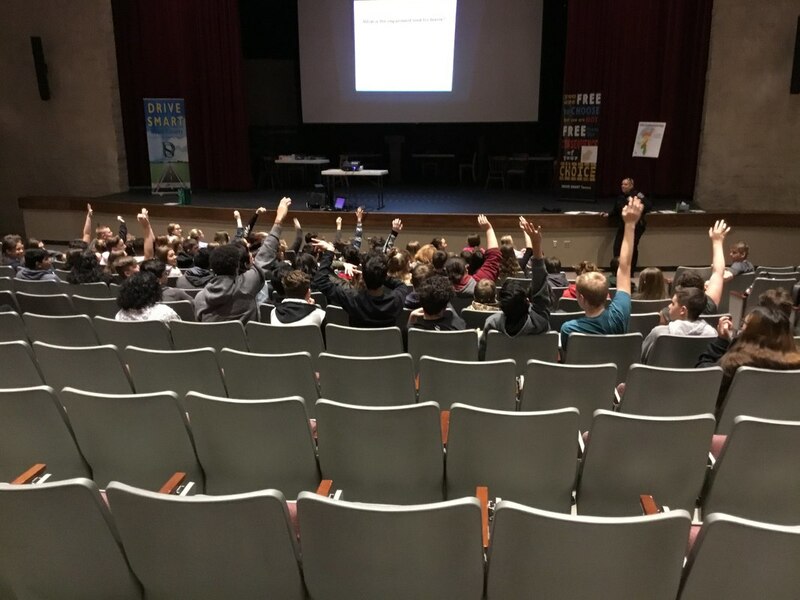 The goal is to empower the students to make responsible choices, keeping them, their friends, and family safe when driving or riding in a motor vehicle. In addition to the DRIVE SMART Teen Driving Program, State Farm is providing funding for the no cost Parent of Teen Driver Classes (PTD) which give parents and their teens training to understand the State of Colorado Graduated Driver’s License laws. 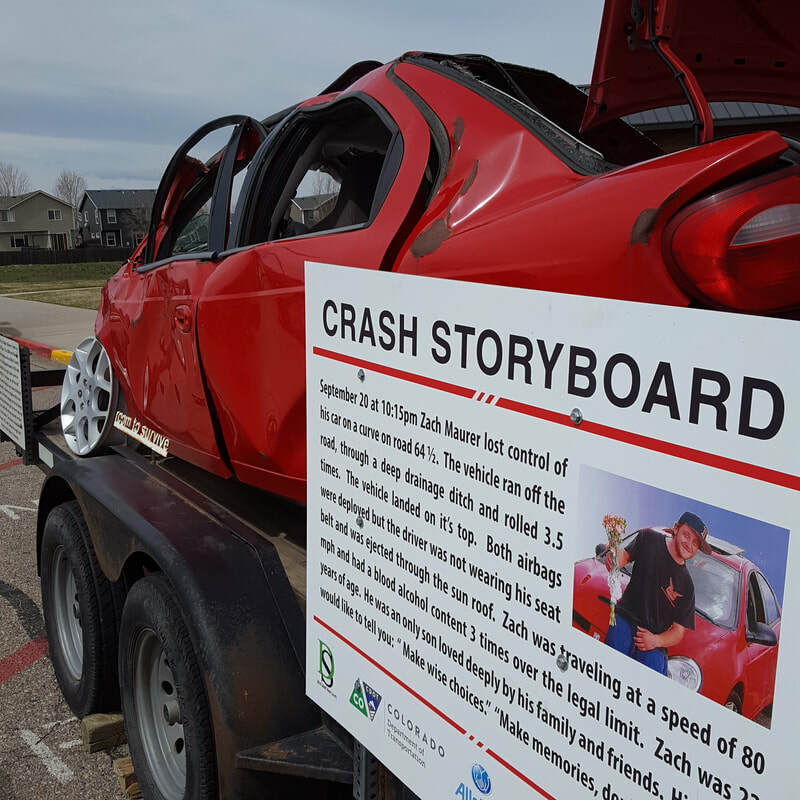 Additional funding from State Farm is key in community efforts, allowing Drive Smart Weld County to further educate the youth and community on the need for safety behind the wheel and in the car. Anshor Driving School, a DRIVE SMART Weld County Coalition member, shared this photo of their students in front of the Beware of the Beltless banner. 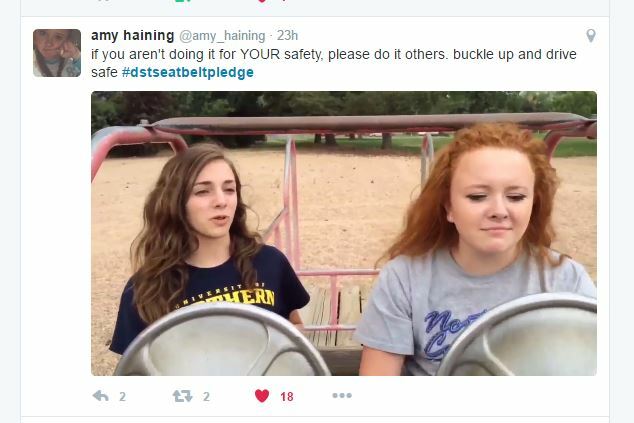 A campaign funded by CDOT to make the public aware how dangerous it is to have unbuckled passengers in the car. DRIVE SMART Weld County Marketing/Public Relations Specialist Lyn Tausan has announced that she will step down from her position with DSWC to return to teaching at Windsor Charter Academy. We wish Lyn the best and thank her for all the miles and smiles she gave to the coalition! She worked tirelessly with schools and the public to spread the message of traffic safety to Weld County residents. Marjorie Hanson who has been with DSWC since 2000 will step in to the position. DRIVE SMART Weld County is proud that Greeley Police Officer Steve Duus was awarded by MADD for his Outstanding Dedication to School Outreach on Wednesday night. Several coalition members attended the event and were proud to have nominated such a worthy candidate. Thank you Steve for all you do for DRIVE SMART Weld County and our community! DRIVE SMART Weld County secretary Kelly Campbell presents University High School principal Holly Sample with $400. University senior Jake Clark's thesis and safe driving campaign won the school best overall large school challenge participant and most improved large school seat belt rating for the 2015/2016 school year! Roosevelt High School completed their final seat belt check today and received a total of $400 for their first place small school challenge work and most improved seat belt rating for a small school! Congratulations! 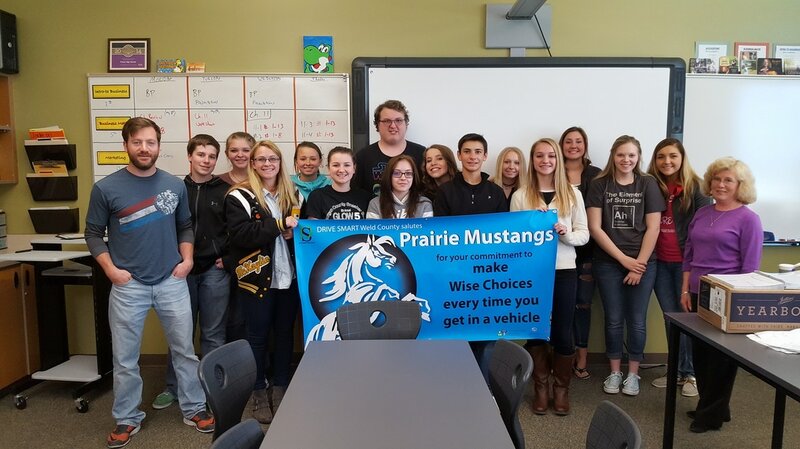 DRIVE SMART Weld County awarded Platte Valley High School today for their participation in the small high school safety challenge! They won $200 for their first place video and events throughout the school year. 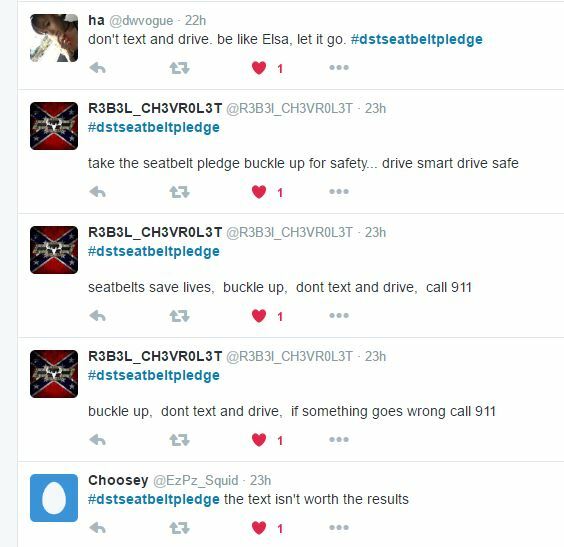 Tomorrow they have their final seat belt check.